Quickly Doug, before you forget everything. Write down everything you remember from Stockholm. That’s what I’ve been telling myself for a few weeks now. In this new life in China, everything goes by at such a pace that it’s easy to just leave a memory behind. Not that that’s not an issue for me normally, of course, but circumstances are…exaggerated, to say the least. So please bear with me while I dive into memories that are already over a month old. I’ll get there eventually. I appear to have arrived for a rare sunny Stockholm day. There’s no lack of colour on these buildings. 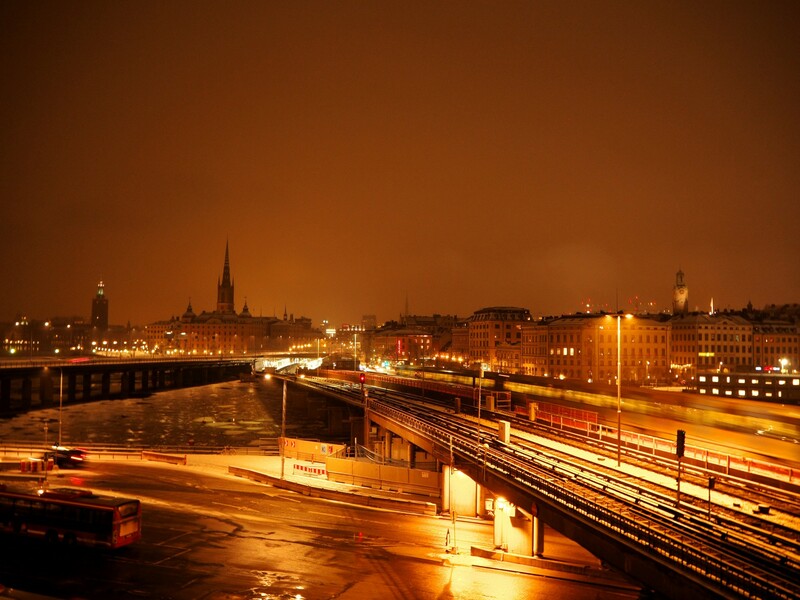 I arrived in Stockholm in the deep of night, at an airport far outside the city centre. Luckily, I’d been organised for this particular trip (or relatively so, at least) and I’d booked a coach to the centre. From there, it wasn’t far to my hostel. Only, it was. At least with all my bags for China it was. 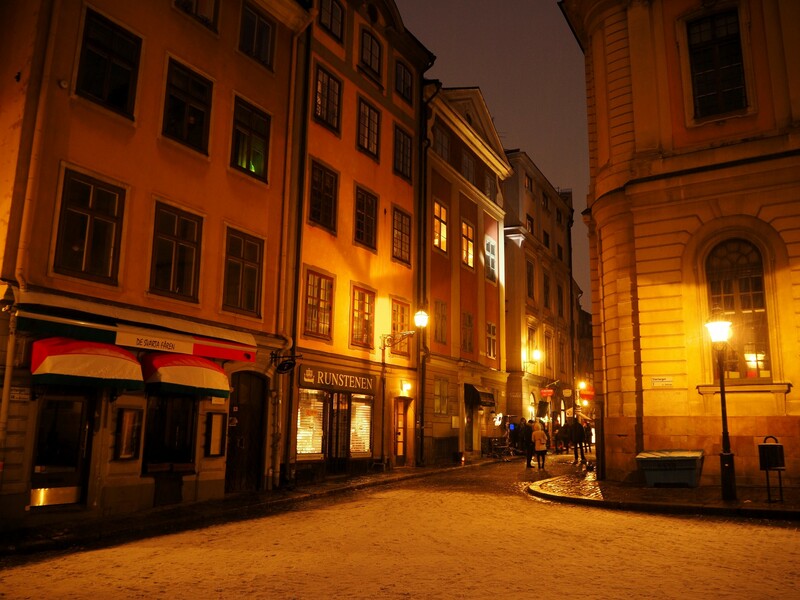 With all of Stockholm Old Town’s cobbles it was. Nothing says “Look at me – I’m a TOURIST!” more than noisily clattering your hulking suitcase down deserted midnight streets, sweating heavily despite the sub zero temperatures. A suspicious looking Australian guy was smoking outside the hostel when I eventually arrived. 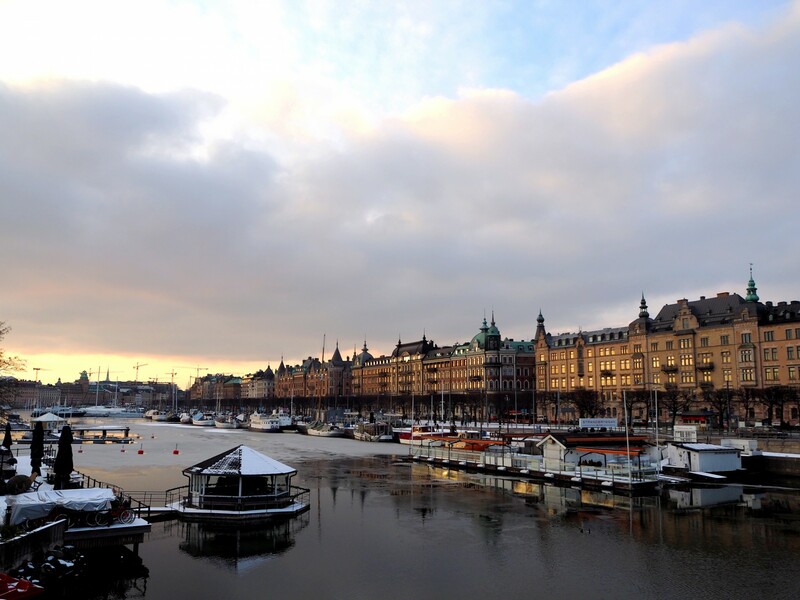 “I think I’ve just woken up the whole of Stockholm”, I told him. He didn’t disagree. Looking over at parliament house at night. Easier to navigate in the daylight, sans suitcase. Luckily for me, when I woke up the next morning, no-one seemed to have connected my face to the dreadful racket, and I was able to wander the city unaccosted. The sun was out, and in the more well trodden areas there was no snow on the ground, so I went in search. I’d not seen any all winter! 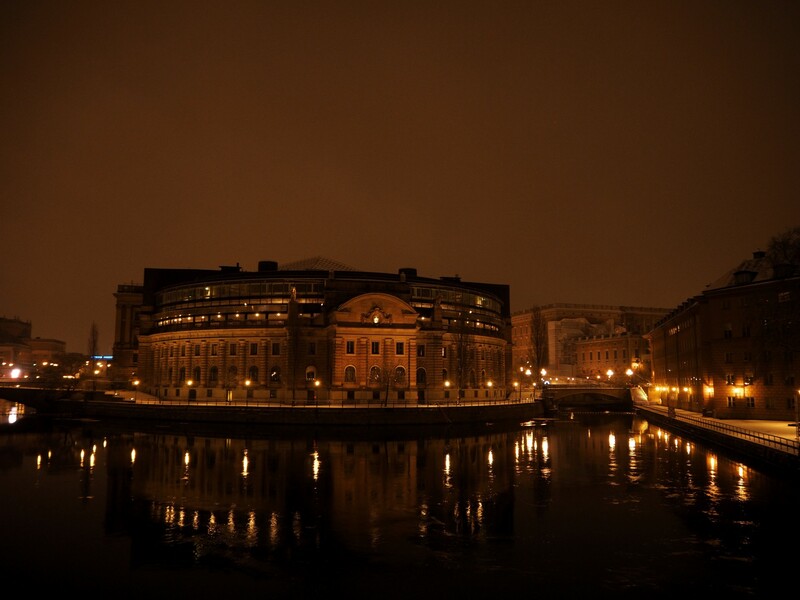 I split from Gamla Stan, the central island with the original town still preserved, and moved over to Skeppsholmen. These streets did have snow. 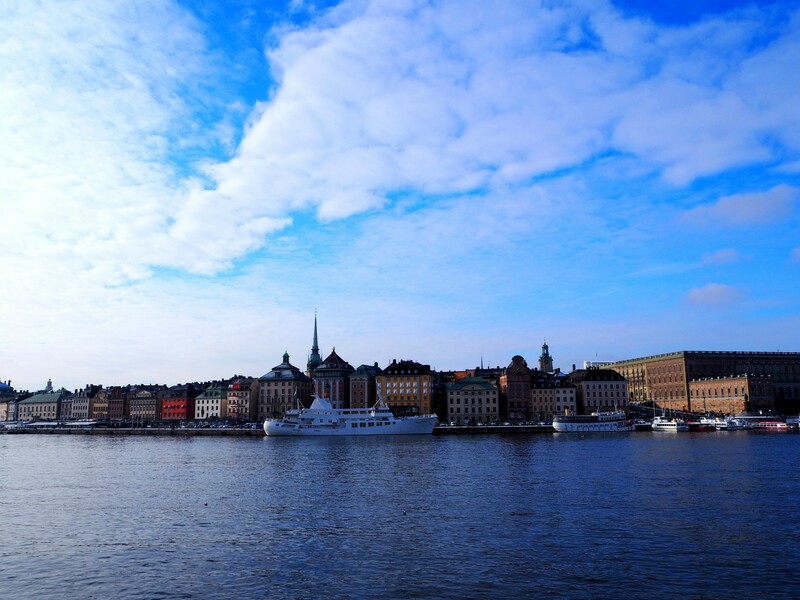 They also had amazing views over toward Gamla Stan and other parts of the city. Strangely though, everything seemed very quiet. I was there on the weekend, when surely everyone should be out, but there was none of the hustle and bustle that you’d find in most city centres. Just a few people out for a walk or a jog around the picturesque Stockholm archipelago. Unhurried, I eventually found my way to Kastellholmen, which is a tiny island with not much more than a red castle on top. 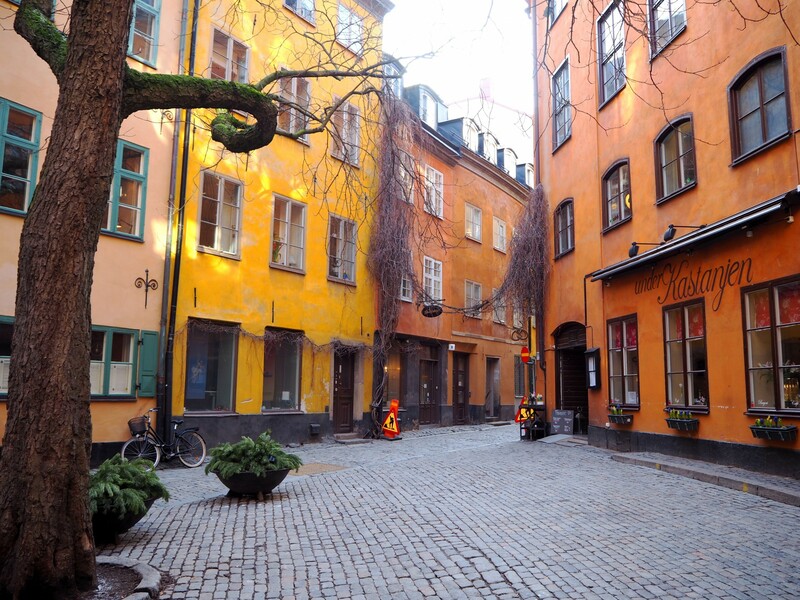 What it was used for, I was unsure, but the bright brickwork, like much of Stockholm’s architecture, stood out in the cold air. It’s not the tallest building ever, by any means, but if you sailed into the bay you couldn’t miss it. 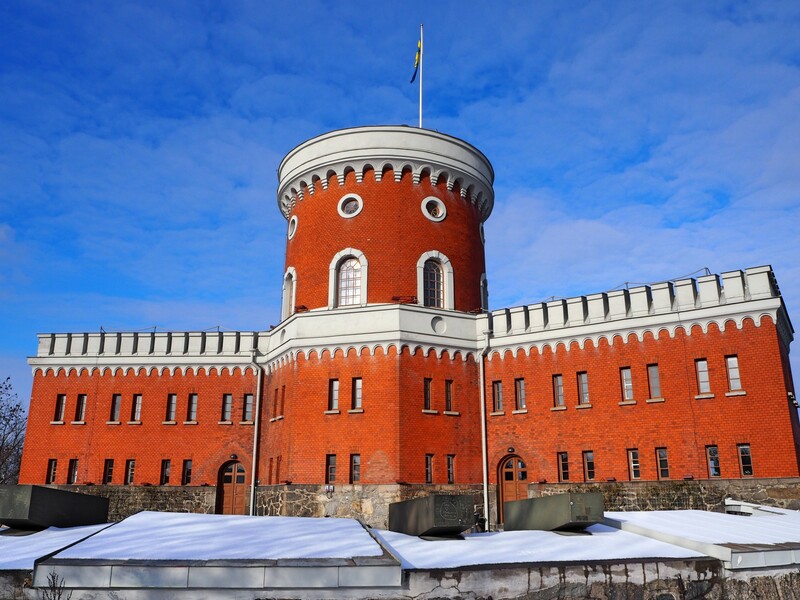 The castle at Kastellholmen. Would never have guessed there would be one from that name, would you? The scattered island nature of this part of central Stockholm means that everything takes a while longer to get to than you’d originally think. I decided to go to the Vasa museum, which I knew was on the island of Djurgarden, just opposite the castle, but to do that on foot you have to backtrack onto the mainland, walk along the pier for a long stretch, and cross onto the final island. There’s plenty to see though. Or at the Vasa museum, one thing at least. That’s the Vasa itself, a 17th century warship that sank only a few minutes after setting sail on it’s maiden voyage. Too easily caught in the wind, a result of it’s slimline profile, low cannon holes, and a second set of higher cannons that meant the ship was too top heavy, it never made it out of the archipelago. 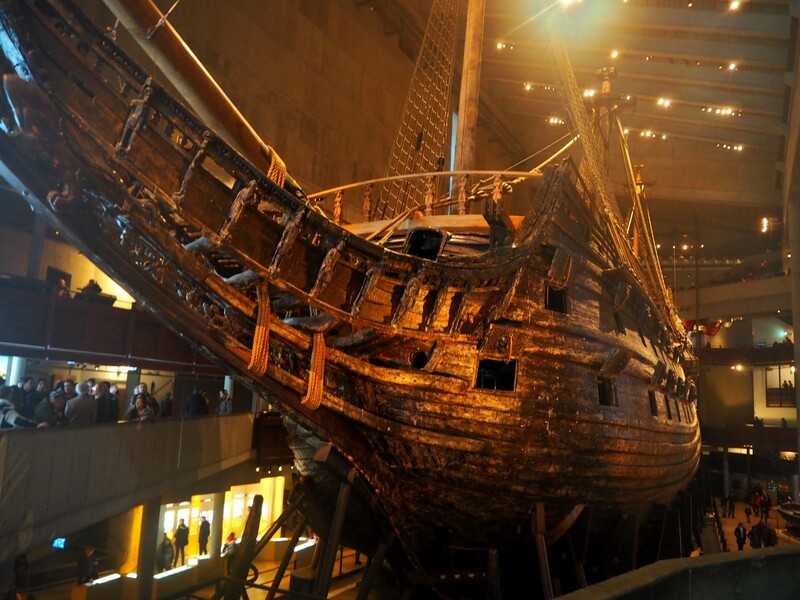 The Vasa lay there, preserved in the brackish water until 1961, when it was found only 30 metres below the surface. Now, it sits in it’s own custom made museum, and as interesting as everything else is, the ship itself is the real attraction. Imposing would be the word. It looks bigger in person. 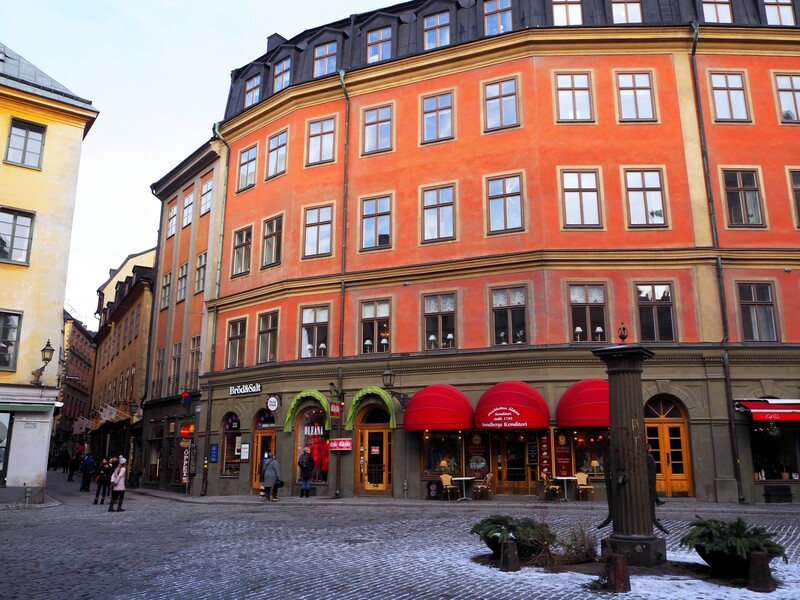 As it is when visiting any new place, much of my time in Stockholm was spent deciding and searching for what to eat. I’d missed out on real dinner the night I arrived, so when I’d needed breakfast I’d found myself eating a lot of kanebulle (cinnamon buns). Not a traditional breakfast item, I think, but they did the job. For dinner, I had to figure out something else. Someone recommended a pizza place to me, which while not quite Swedish did sound good, but it was packed full of people. I mean packed so much that I couldn’t get in the door. So I had to rethink my plans. Luckily, I’d bookmarked somewhere else to go. A bit further away perhaps, but surely the trek would be worth it? It was. Apparently the people love meatballs, and I’m definitely included in people. Moose meatballs it was for dinner. I traipsed back to Djurgarden the next day, keen for a bit of a walk before I started my city life in China. The snow had come down a bit more overnight, and continued throughout the day. It was much colder, too – I couldn’t take my hands out of my gloves for more than a minute before they were frozen. 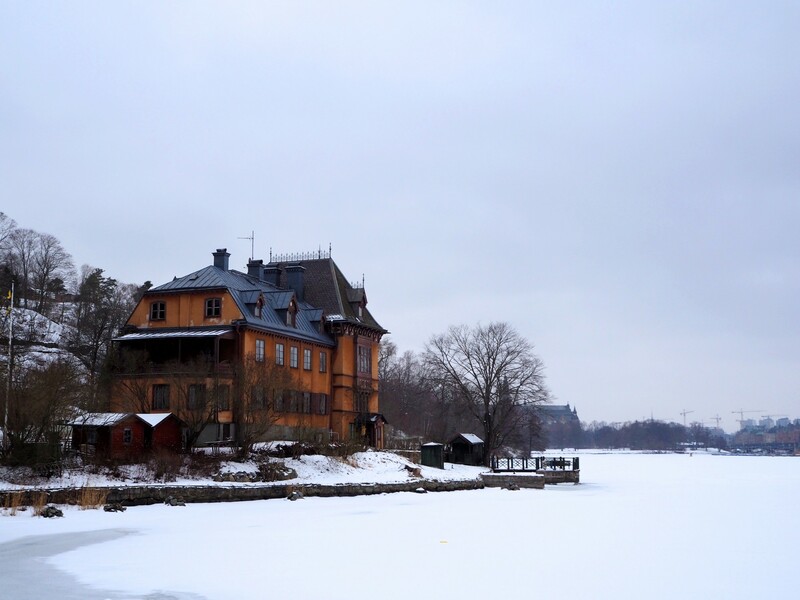 In the Djurgarden there were weird, spooky looking houses and dark woods. Grand summer palaces for old kings and ice floes that sang haunting songs. It was a slightly surreal place, no doubt due largely to the icy influence. Nevertheless, I always appreciate the fresh air. A creepy house next to the frozen sea. Yes, it’s that cold. 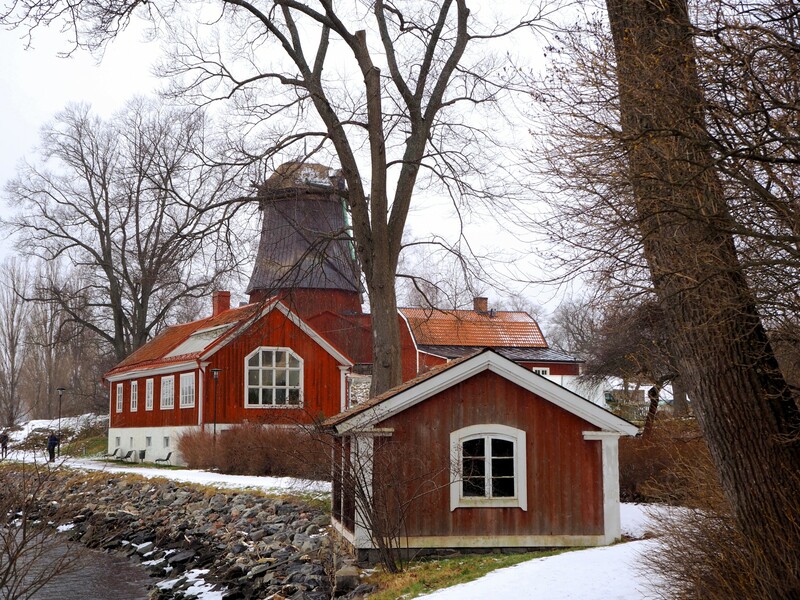 Red buildings in the Djurgarden. The city was still there when I got back, almost forgotten in the gardens. Now though, was the time to take advantage of the dark. 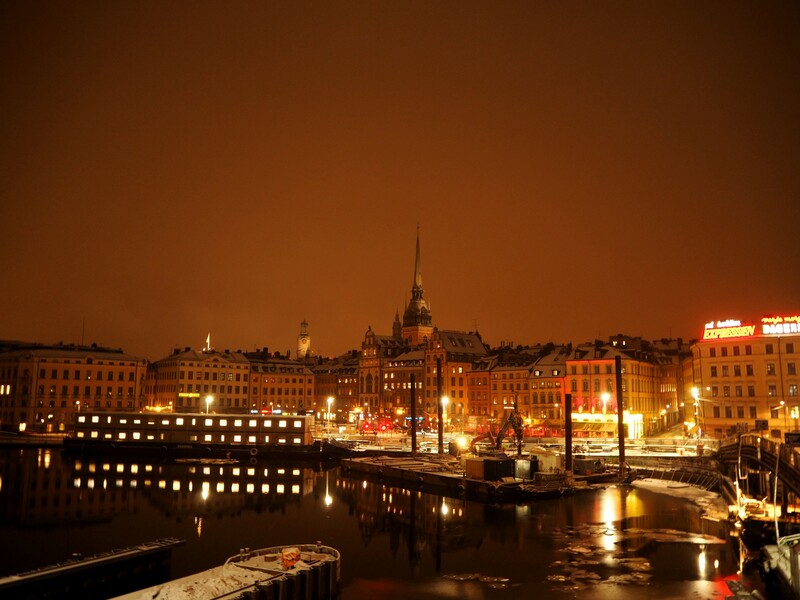 Stockholm lights up beautifully at night, and I fully intended on taking some nice photos. 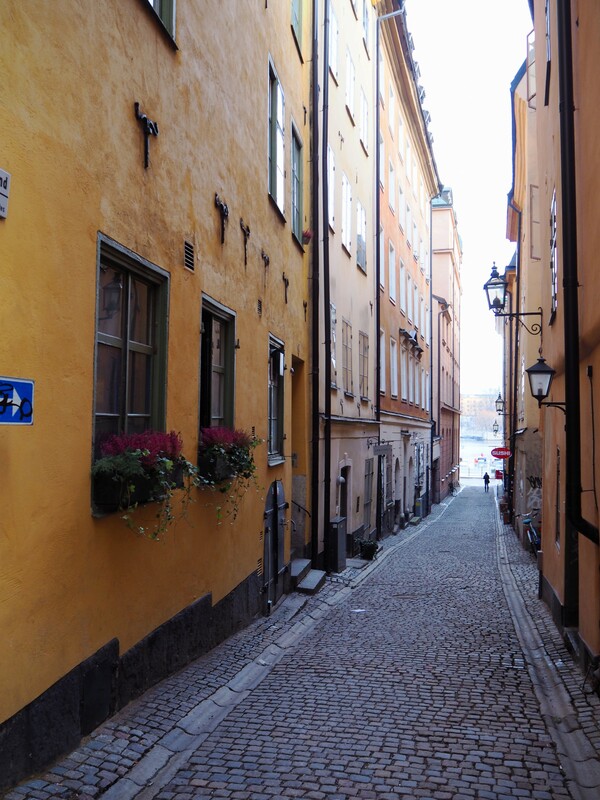 To do this, I figured I might as well learn something at the same time, so I ended up on a walking tour of the sinister side of Stockholm. Disappointingly for our guide, as free walking tours work on tips, there were only a few of us. I suspect people were scared off because of the snow, and maybe some of the weekend trippers had left already. Our guide didn’t suggest she noticed any of this, though. 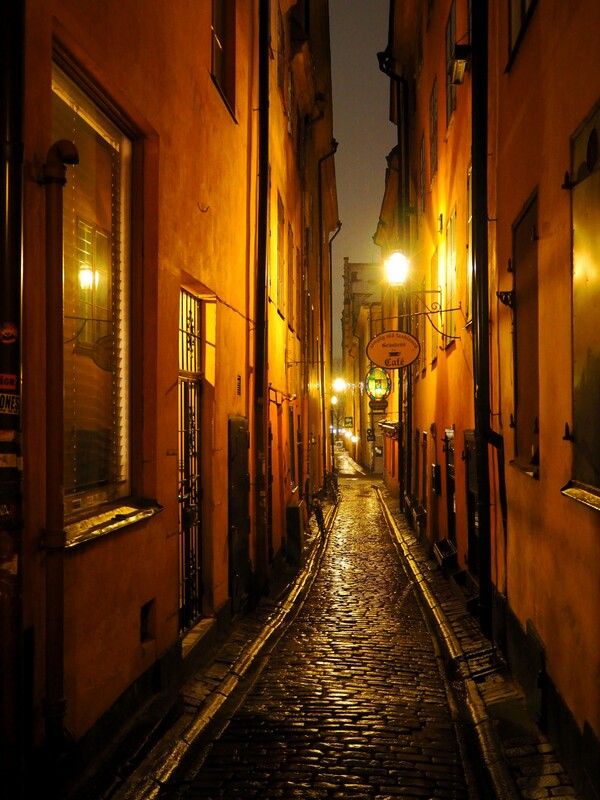 Eagerly, she led us from one small alley to another, enthusiastically telling us unfortunate tales of the residents of Gamla Stan in a constant stream of English that was hard for me to understand. Maybe I was tired, because it seemed I was the only one who was having trouble keeping up with it! A square with a hot chocolate shop. Maybe that was down to the multi tasking. As well as trying to listen, I was on the lookout for an ATM. I hadn’t needed one since I’d arrived – everything can be done on card in Sweden. But can you pay your tour guide’s tip with a card? Probably not. Unfortunately, I could find none. Ridiculous, really. A beautiful, old city centre and no-one has desecrated it with an ATM for my convenience. At the end of the tour, I nervously tried to think what I could do. Had it been a bigger group, I could have bailed early, conscience only slightly tarred, but I couldn’t do that now. I hung around anxiously at the back, thinking, and not getting very far. At last it was my turn. I turned, and heard the words that sent relief through my spine. “I accept any kind of money, guys!” Phew. 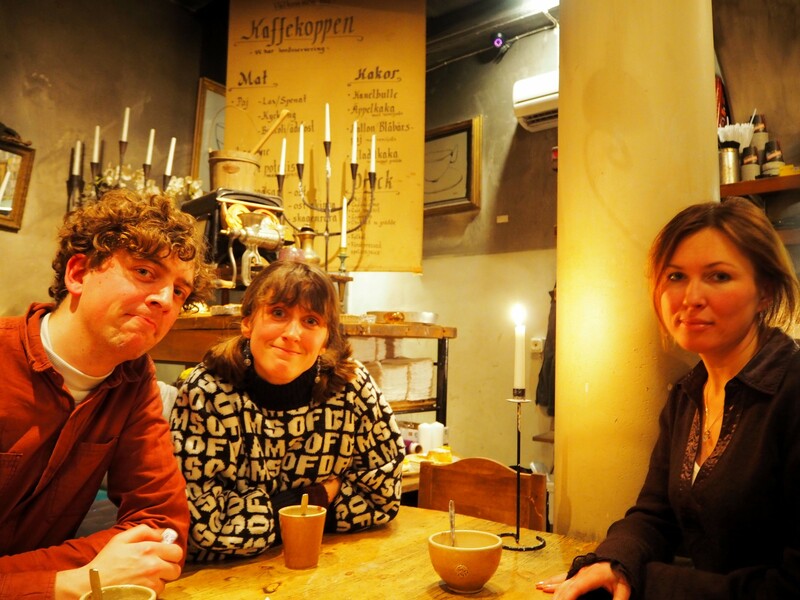 A few minutes later, Gruff and Hattie (two Brits on the tour), our tour guide (surprise, surprise, I don’t remember someone’s name again) and I ended up going to a little cafe and getting white hot chocolate. Is that a thing in Sweden? It was…sweet. Very sweet. 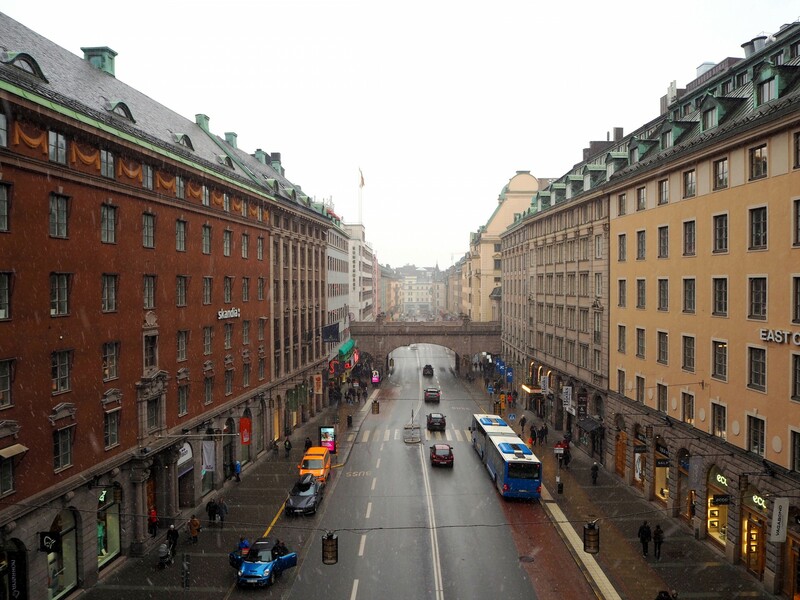 That, and getting a few beers in Sodermalm, were my last real actions in Sweden. After a very sugary hot chocolate. Damn those building works! Always in my way! Look for the speeding train. Oh, except for some herring from a scruffy looking van in the morning. The rest is, as they say, history. The history of my awkward start to China. Soon, more news from within China, so stay tuned! Aeroplane, City Exploration, Money Issues, Scandinavia, Spectacular Views. Bookmark.